A great set for your kitchen! 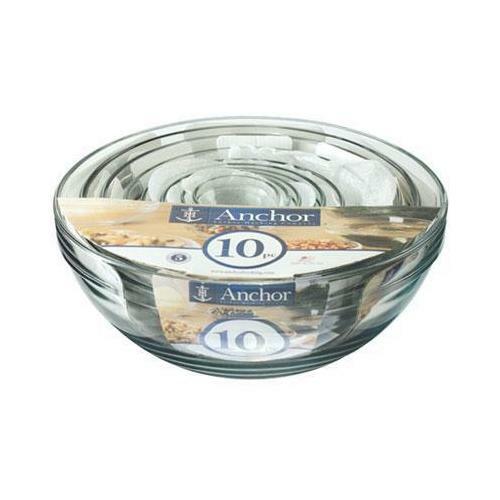 The assorted sizes in this Anchor Hocking 10 Pc Nested Mixing Bowl Set offers nearly every capacity of bowl you need for mixing recipes for your family and friends. This sturdy set, made of a special tempered glass, lets you see what you are combining together. Easy to use and easy to clean, the perfect combination for meal preparation and healthy cooking. Bowl sizes include 1 oz., 2 oz., 4 oz., 6 oz., 10 oz., 1 qt., 1 1/2 qt., 2 1/2 qt., 3 1/2 qt. 10 pieces Provide a nice assortment of mixing bowl sizes for your food preparation. Nesting bowls Offer a more compact storage option for cupboard or pantry. Transparent glass mixing bowls Make an easier job of checking to see how well ingredients are blended together.